SKU: PJC02. Categories: Party & Event, Miscellaneous Party, Games/Entertainment. Tags: horse shoe set, horseshoe set, outdoor games, picnic games. 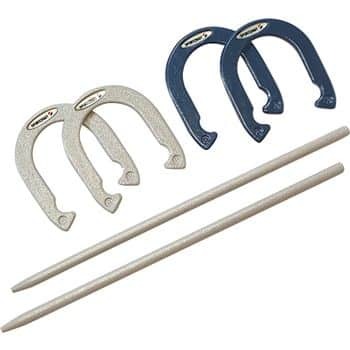 This horseshoe set includes 4 horseshoes, 2 stakes, and instructions. A fun game and easy add on to any outdoor party. The rotisserie on this grill has a maximum capacity of 120lb. It can also come with a standard grill top which measures 24″ x 60″. Comes with full 40lb propane tank. 3 separate 30kbtu heat-controllable burners. It has stainless steel tops which can be opened from either side of the grill and collapsible stainless steel counters on both sides. In order to transport this grill you will need a hitch with 2″ ball. This grill includes a full 20lb propane tank. 8 separate 20kbtu heat-controllable burners. 16″ x 65″ cooking surface. Place grill on a level area clear of combustible materials. Prior to opening main cylinder valve, and lighting grill, place all control knobs in the “CLOSED” position (turned to the left). Open main cylinder valve. Light a burner and turn the burner control knob to “OPEN” (pointing at you). The burner will ignite instantly. The second burner in each section will instantly light by simply turning it on. Since each section is ignited separately, only light the section required. Once burners are lit, adjust the control knobs to desired temperature. When finished cooking close all control knobs, close main cylinder valve and disconnect propane cylinder. This grill is designed FOR OUTDOOR USE ONLY.